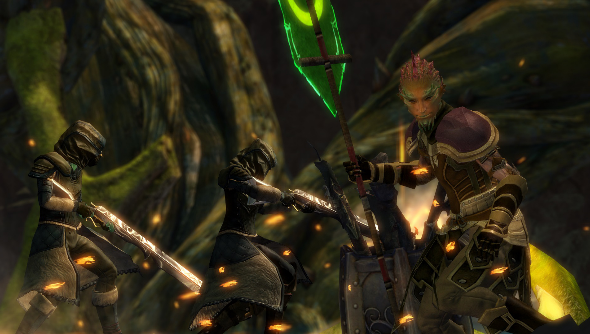 Few MMOs have dedicated themselves to growth with the gusto that Guild Wars 2 has. The game launched with a strong narrative-led campaign, but has continued to grow in the two-and-a-half years since. The ‘Living World’ system has been expanding the world and lore of Tyria each fortnight, and as Season 2 concluded earlier this year, some genuinely shocking revelations shook the game’s community. Heart of Thorns is the next step. More than just an extra chapter of story, it’s a full expansion pack. It opens up the jungle land of Maguuma, lays the foundations for a whole new levelling system, offers a MOBA-like PvP mode, and introduces a brand new profession that’s the game’s most ambitious by far. 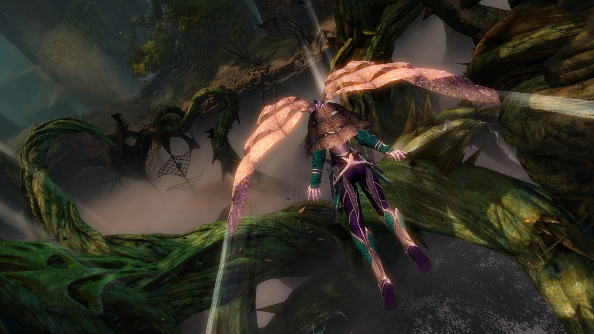 It’s the gateway to Guild Wars 2’s future, and it’s really rather exciting. 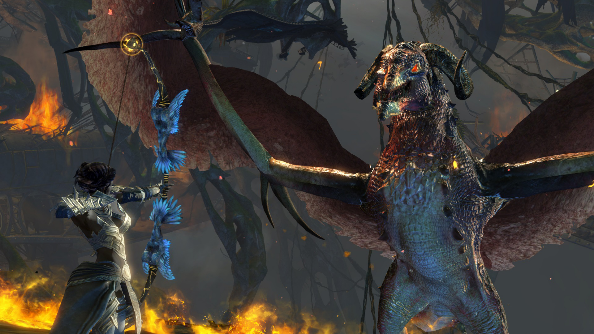 Without a level cap increase, Heart of Thorns has to offer progression in another form. You’ll find it in Masteries; a new set of skills that can be learned and developed using points rewarded by quests. They’re skills that are focused on adventuring: one allows you to learn how to glide across the map and ride on air currents. Another teaches you new languages which allow you to learn about other cultures, unlock new potion recipes, trade with new races, and improve key combat skills. “These are tools that give players the ability to build upon what they’ve already established, the foundation that they’ve possibly put two-and-a-half years of work into,” said Boettiger. You can drop points into the Masteries system however you feel, either focusing on a specific trait or gaining a broad but limited knowledge of all of them. “It allows the player the agency to figure out how they want to level themselves up in ways that work with their own playing style, that meet the needs of the kind of things they want to explore,” said Leah Hoyer, Arenanet’s Head of Narrative. Some Masteries, like being able to bounce on mushrooms, feel a little unnecessary. Yet the majority appear to enable players to take new and interesting journeys. They’re also just the start: as the Living World continues, updates will be able to add new masteries to ensure it’s a continually growing progression system. It’s an unusual trade-off for a raised level-cap, but one that looks to offer some genuinely meaningful, lasting choices. Talking of choices, they’re a key element of Heart of Thorns’ new profession: the blindfolded Revenant. Arguably the game’s most exciting class, it’s a heavily-armoured mystical warrior with the ability to channel the spirits of legendary personalities from Guild Wars’ history. In the demo I played the Revenant could choose to call upon two spirits: that of Dwarven king Jalis Ironhammer, and demonic nasty Mallyx the Unyielding. For anyone who’s played the original Guild Wars games, these names will be familiar; the Revenant is a real fan-service class. When channeling these spirits, you’ll be granted five new skills based on the powers of the character, in addition to your existing weapon skills. Not only that, but the spirit’s personality will become a kind of ‘sidekick’, chatting to you as you battle. “With [the Revenant] you get a spectrum of complexity,” explains Hoyer. “Jalis is a much more straightforward kind of character, and Mallyx has more intricacy.” When channeling Jalis, you’re able to use several hefty Dwarven themed attacks, such as wrapping enemies in a chain to slow and taunt them, or hurling hammers around you in a cyclone. Swap out to Mallyx and things are a little different. As an enemy boss from the original games, he’s less happy that you’re using his abilities, and punishes you for doing so. Whilst powerful, using them will always have a trade-off: they’ll cripple, blind, or torment you with every cast. It makes combat exciting, and being able to swap between them at any time keeps battle significantly more fluid; with all your skills on cooldown you can simply swap to another spirit to continue casting. “You’re going to be given the necessary pieces, whether you haven’t played in six months, or a year, or if you’ve never played. Because Guild Wars 2 is always a game we’ve encouraged community and cooperation in. We want die-hard Guild Wars 2 fans to be able to go to their best friend, their spouse, their kids, and say ‘I know you’ve never played it before, but now’s the perfect time for you to come in and start playing it with me’ “. 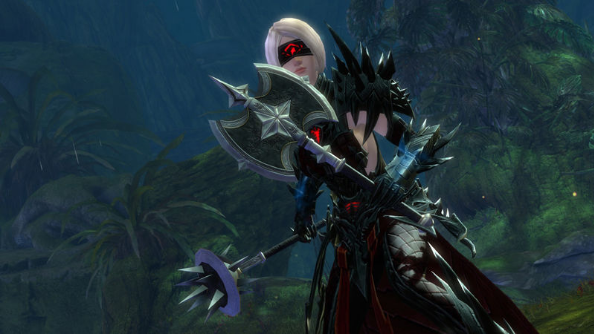 Hoyer is right: it does seem to be the right time to get into Guild Wars 2. The opening of the Heart of Thorns demo saw helicopters crashing into jungle canopies, snipers firing on walking trees, and an epic battle with a dragon that set the jungle floor ablaze. The world of Tyria is at an exciting branch; and even if you’ve no idea what’s been going on there’s no denying the thrill of marching into battle on a new foe. Whether you’re a veteran equipped with new Masteries, a returning player picking up their sword again, or a fresh recruit looking to channel some spirits, Heart of Thorns seems dedicated to offering an exceptionally strong experience. It’s easy to question why this new experience couldn’t be just another set of free fortnightly updates, but that would be a result of looking too closely at the surface. “The kind of changes that we’re making to some of the core systems in Heart of Thorns is setting us up for where we want to take it next,” said Hoyer. Essentially, this expansion is the scaffolding framework that will let Arenanet continue to build Guild Wars 2 higher and more intricate. And if that allows another two-and-a-half years of Tyria’s evolving world, then I think that’s a worthy reason.